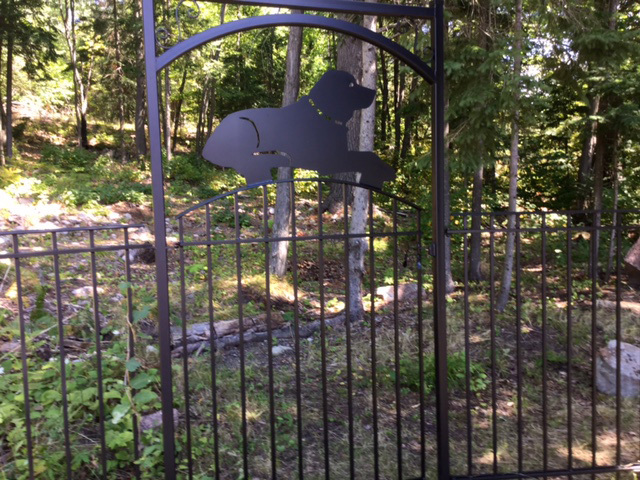 Evergreen Landscaping did major repairs on my 20-year-old driveway and built a new fence to replace an aging, damaged one. James and his crew were thoroughly professional. James is a perfectionist who ensures the job is completed to the highest standards. 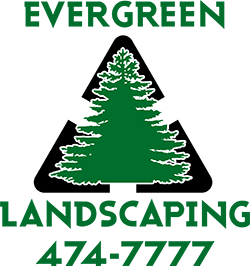 I would not hesitate to recommend Evergreen to anyone requiring landscaping work. These guys are awesome! The owner James was very professional, knowledgeable, and extremely friendly. He spent a good amount of time with us to ensure we got exactly what we were thinking. Helped us pick out the proper stones for our patio and told us advantages and disadvantages of different stones. He also gave is proper drainage for our back yard. His crew was friendly and kept the job site tidy. Very hard working crew. We were very impressed with the experience and will rely on evergreen landscaping for all our future projects. Thanks Evergreen! I myself was lucky to gain employment to Evergreen Landscaping. I was able to see the company from the inside out. Evergreen is run by a Sturn but understanding super attendant. The contracts that the company gets. Has to be treated and worked as if its your own house or yard. Once completed on time and mostly ahead of scheduled. The super attendant would walk threw the project with the house owner. And if there is a little stone not placed back to its origenal position everything is put to a halt to place that stone back to were it was before we stepped out of our vehicle. All and all what I can say is this I have worked all over Canada and for different company’s know that found evergreen I believe, that I have found a home. Not because of the nor leaving O.N.T but its because of James who treats his employees not like numbers but like family. And work ethics should b the way that every company is run. 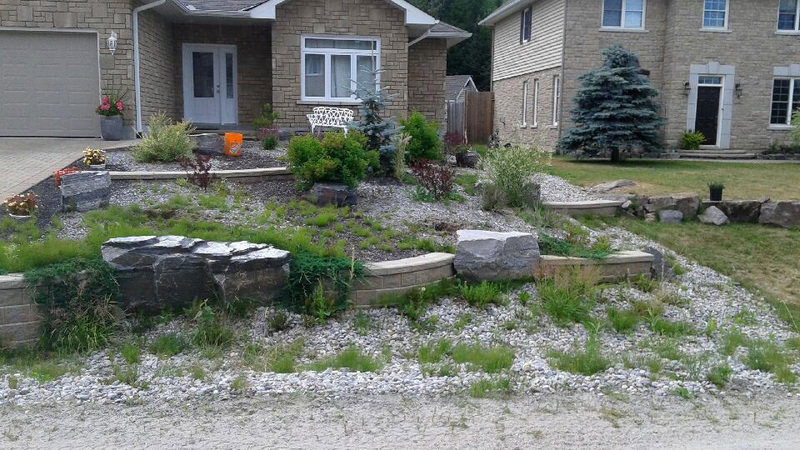 While driving by noticed the freeze/thaw had moved the landing stones on a 3 year old project. “We thank you so much to have come to look at the steps and landing. We were so disappointed with the look of it that we kept putting off asking you to come over. The fact that you came without us asking and had it repaired in such a short time is important to us, it shows that you honour your commitments. We choose your company because you inspired confidence. We have always been “shop local” people who recognize there are very competent and trustworthy business owners in North Bay. We finally acknowledged that our front yard required a makeover and after visiting James at the Evergreen Landscaping booth at the Home Show we knew that this firm was “The One”. We didn’t need to look any further! James presented creative design ideas that solved both aesthetic and drainage problems in our yard – opening the street view to our home, updating the look with low maintenance landscaping and beautiful interlocking brick. What a transformation! James, Tina and their team are professional, personal and punctual resulting in optimal customer service! They say what they do and do what they say! Thank you Evergreen! Evergreen Landscaping just completed a project for us which included new interlocking brick and in ground sprinkler system. We had seen the work Evergreen had done down in our neighbourhood and we called James to provide us with a quote and some ideas on how we could improve on what we thought was the way to go. From the moment James arrived, provided the quote and gave us some alternative ideas, we knew we were in good hands. The quote was specific and very professional. When his crew came to our house, James introduced his employees who would be doing the project. The workmanship was excellent, on time and on budget. The site foreman, Chris, was great, keeping us in the loop and letting us know what was planned to be completed each day. 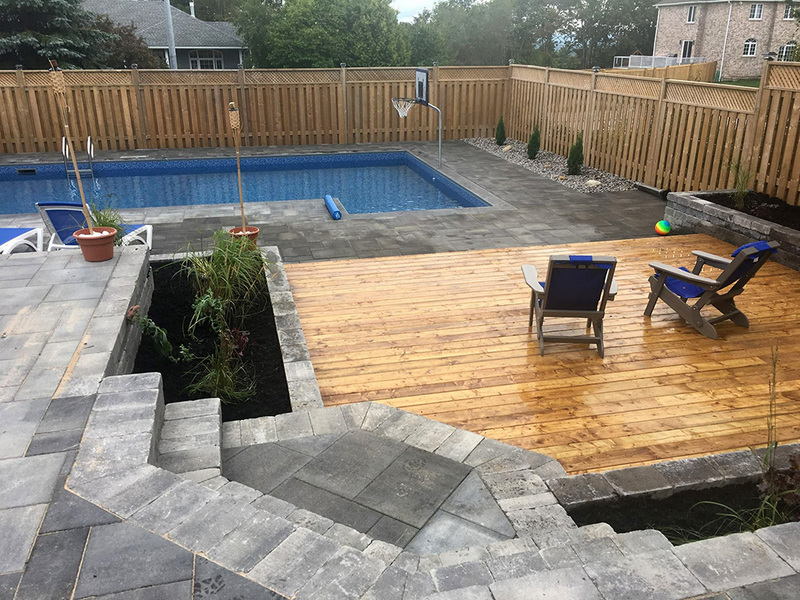 We were very happy with the end product and we cannot say enough about the workmanship and professionalism of James, Tina, Chris and everyone at Evergreen we came into contact with. We approached Evergreen Landscaping because we desperately needed to do something with our front lawn. The lawn had become infested with grubs, the grass was dying and would only grow in patches. It looked like a complete disaster! James and Tina, helped us by designing a unique low maintenance, low water front yard. The result was amazing! 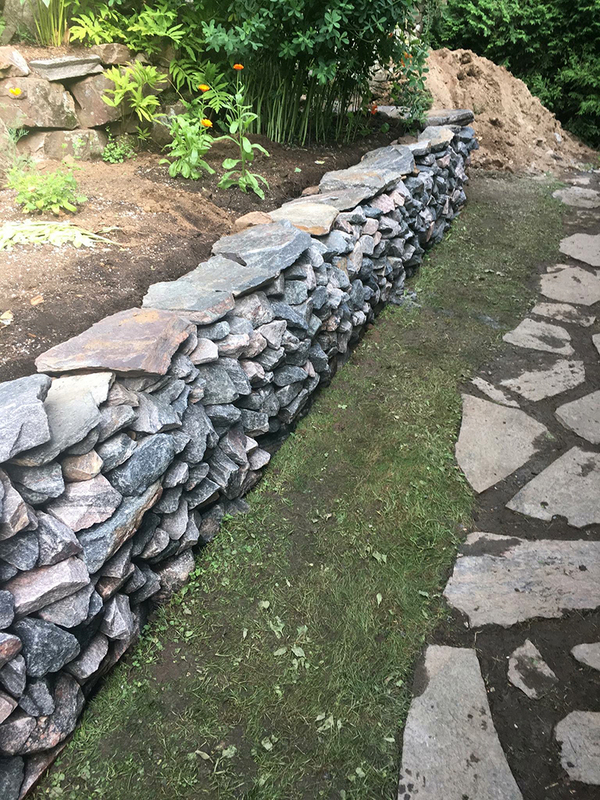 James, Tina and their team redid the front yard complete with large stone steps leading to the side of the house and a beautiful focal point of a dry river bed. There is no grass! Only two shades of mulch and gravel pathways. They added several gardens with grasses, tree, shrubs and flowers to tie it all together. The quality of their work is fantastic. It now is a lovely space we plan to enjoy for years to come. One thing we liked is the fact that James and Tina always consult the customer. From the beginning of the project to the end we were always consulted. We found this experience extremely pleasant. It was exciting to watch the yard transform before our eyes! 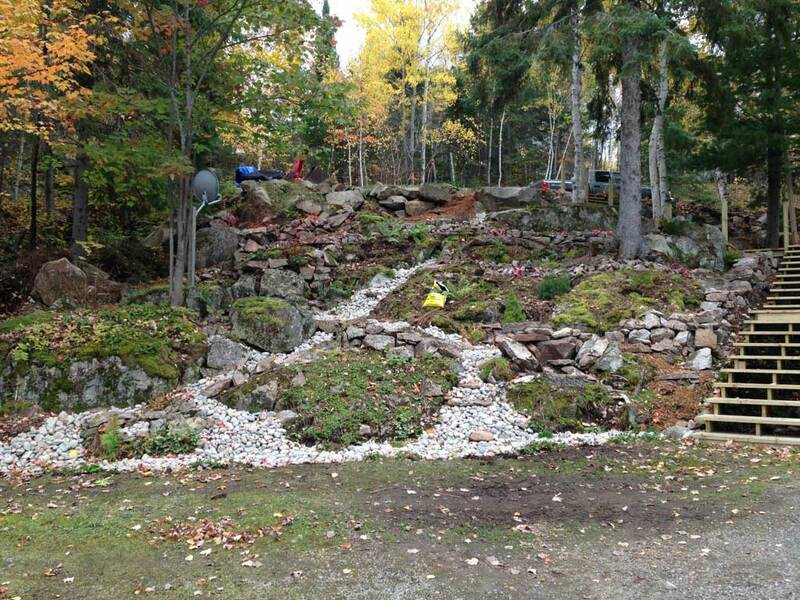 Thanks to James and his staff at Evergreen Landscaping for the excellent job they did at our rural property. We wanted to finish our yard with hardscaping to cut down on the tracking of sand into our home. Our home is on the lake so we wanted to preserve the woodland environment. James met with us several times and helped us work through the plan and budget. He had great ides to help us achieve our objective. The staff onsite were careful, courteous and hardworking. They kept us informed at all stages. The work they did was meticulous. We are very pleased with the result and have many positive comments by family, neighbours and friends. Thanks to James and his staff for the excellent work. It is hard to believe that almost half a year has past since the water main break at The Gathering Place. I wanted to let you know again how much we appreciated the kindness, professionalism and timely services provided by you and your staff. It was a difficult time for us as you can imagine, and just knowing that we were being looked after properly was a great comfort. I really appreciated you sharing your story with me – it gave me even more insight into why some of our neighbours in need end up in a seemingly endless spiral of despair, while others manage to pick themselves up, and with little to no help, make a life for themselves and those around them. You are an inspiration to me, and your generosity to The Gathering Place will never be forgotten. I wish you and your staff and your family the merriest of Christmases and a wonderful New Year. I also want to comment on the excellent crew that was here. They worked steady and efficiently (even in the crazy bugs! ), they left the job site spotless every day and were respectful and good to deal with. You should be proud of these guys…the work they do is physically demanding, plus they have to deal with bugs, weather and lots of different people…which can be challenging I’m sure. 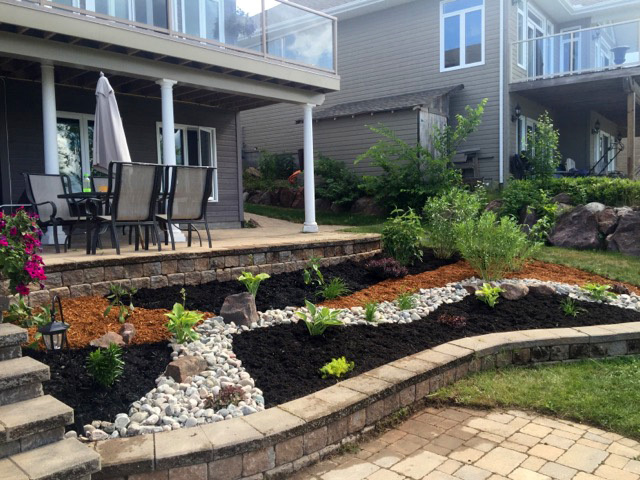 We will highly recommend Evergreen Landscaping to our employers, friends and neighbours. You have been so good to work throughout all stages of this project. Are you from out-of-town and need some landscaping done? Call Evergreen Landscaping and stop worrying. I work in Toronto and my mother lives in North Bay. I called James Bissonnette early May 2014 to discuss a project that was on my mind, as a gift for my Mom. After an initial conversation, (30 minutes) James had sufficient information to start formulating a plan. Plans were developed, slightly modified then the Evergreen team went to work. The plan involved getting my mother out to her cottage to assess her physical needs as well as my “grand plan” which involved her being able to enjoy gardening even though bending down is now more challenging for her. The “grand plan” involved building raised gardens to keep her active and enjoying the outdoors. James came up with the idea of placing a seat around the garden. This ensures that if Mom tires then she can sit and enjoy her favorite pastime. With a keen eye for detail, James also pointed out that our cottage stairs were too small to safely accommodate her step. This was a potential danger for her that none of her five grown children had spotted. Given the distance between the project and my job, I also required additional assistance with picking the flowers for the garden. James wife Tina offered to take her shopping to pick out “her favorite flowers”. The project site was immaculate when the job was complete. Also, James and his team delivered; on time and on budget! Some would say that was expected but I can tell you this type of care and attention to detail are rare. The whole team understood the importance of this project to me. My mother means the world to me and since I can’t be with her then at least I could give back in a small way. THANK YOU Evergreen team for taking care of the job site, building my mini-dream and my Mom!! First, we’d like to start by saying that James and Evergreen Landscaping were recommended to us by another very pleased customer. 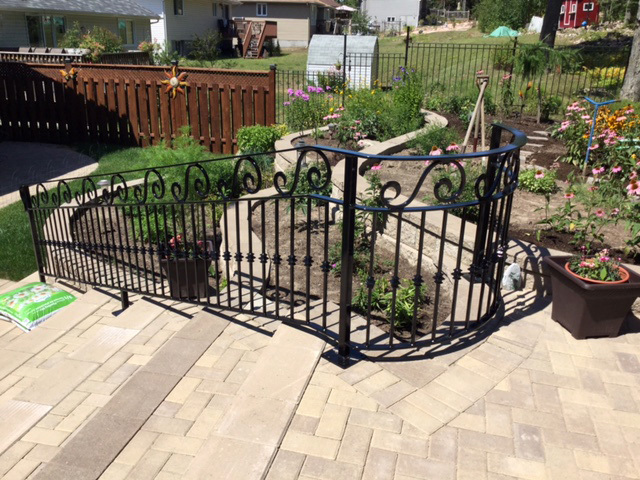 We wanted to replace some old and cracking concrete sidewalks and wooden flower boxes with interlocking bricks. We live out side of North Bay but James came out to look the situation over and give us some ideas. He had some great ideas that we had not thought of. He took us to some other jobs he had done and to the brick supplier for color and style ideas. The job was completed on schedule. The crew were great to have on site. They are hardworking and kept the site orderly and clean as the work progressed. We are very pleased with the finished job. What an improvement. My wife and I called James after a less-than-satisfactory experience with a competitor. His response was prompt and his quote fair. The best thing about James is that he listens to you and makes sure that he understands what you want to have done. The Evergreen crew is hardworking, pleasant, and they clean up after they are done. And after the work is complete, James will check in to make sure that everything is working well. James provides excellent service at the right price. He makes sure that the job is done right the first time. James and his Evergreen landscaping staff did weeping tile at my residence. James met his time line. He was honest and reliable He was respectful to my neighbor in asking and organizing his work on some of her property. He and his staff worked efficiently and were very friendly and approachable. They kept the site clean and completed the job with aesthetic pleasing stone window wells surrounded by clean river stone. I was very pleased with the job and will rehire them for my next project. We were tired of cutting the grass. 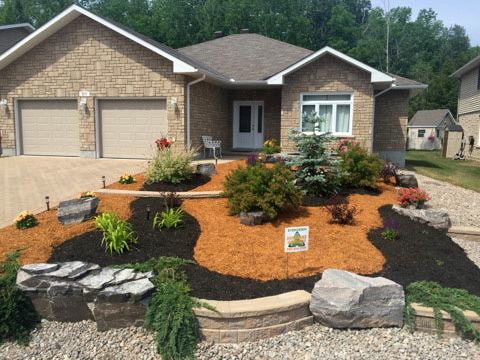 James and Evergreen Landscaping, brought a fresh idea with personal touches for our front yard! They were great in getting the work done, and very friendly in day to day passing. They completed the job on time, and did a great job cleaning up. They also offer great advice on maintaining the look of yard. We are really pleased with the whole job! And would use them again on other projects! Great Job Guys. James and his Evergreen Landscaping staff worked hard to develop and deliver a fresh design for our dated landscaping. We are delighted with the results. It has given our property tremendous curb appeal. We recommend Evergreen Landscaping if you want professionals who demonstrate an old-fashioned work ethic, listen to you as the client, and strive to exceed your expectations. Before calling James I had another landscaper come by and they did my driveway, fence, sod in the backyard, retaining wall and drainage pipe. 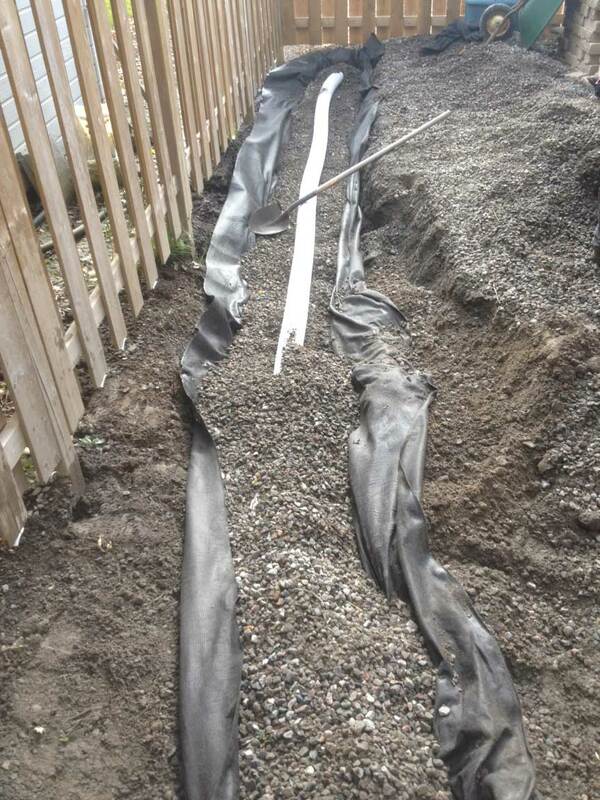 That landscaper made all kinds of mistakes and when the lot next to mine was building their house the side drainage pipe was damaged and part of my fence was on their property. I called James and told him what happened and he responded very professionally. He came by quickly and quoted on what needed to be done to rectify the situation. James and his team took care of my needs and made sure it was done right. I highly recommend James to do the job and I wish I called him in the first place. I would have had the job done right the first time. I have had my front step landscaped with stones and wood. A two tier flower bed was also designed and built by Evergreen. I was pleased with the work done and the completion time was ahead of schedule. I appreciated the respect given to the home owner; Evergreen ensured satisfaction was provided every step of the construction plan. I would recommend this landscaping company. We highly recommend this company. The end result was exactly what we wanted. James listened to us, offered us ideas and suggestions. He demonstrated knowledge and professionalism, and service with a smile. When the project was completed and all traces of debris removed, he returned to meet with us and give us tips on upkeep. We are extremely happy with our front yard. Thank you James, job well done! 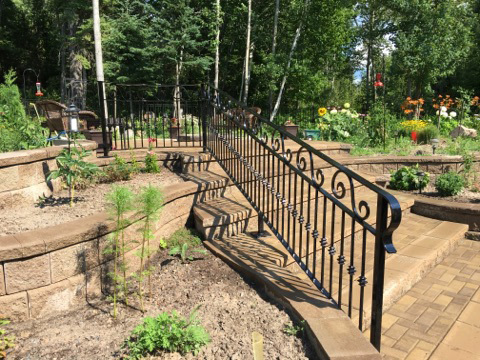 James and his professional team completed a large scale landscaping project that included interlocking walkway/stairs, patio, driveway and included effective drainage solutions. Even though this work was completed in the summer of 2008, it still looks looks brand new and continues to receive “wow” feedback. My wife and I can attest that James and his staff do quality work within agreed to time frames and at a fair cost. We give a huge vote of confidence to Evergreen Landscaping Co. We asked James for an estimate and some ideas. We spent a few hours in discussion. After deciding to have our front yard done by Evergreen, permits were acquired and the work started. The staff showed up everyday until completion. River Rock was added to the original plan as an accent. Plants were moved from the backyard to the new gardens in the front yard. The new patio is enjoyed by us both and many neighbours walking by stop to comment on how great it looks. We are very pleased with the work done by James and the Evergreen Crew. Completion was on time and on budget. Great Job! Thanks!